On the basketball court, there is no doubt Philadelphia 76ers starting point guard Ben Simmons is a serious contender for the NBA’s Rookie of the Year Award. But he is making headlines off the court, too, by helping families in need during this holiday season. 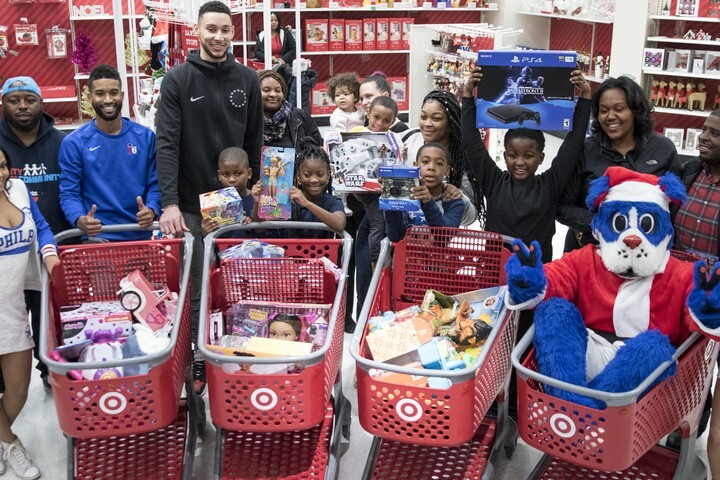 Little did the invited families, including two from South Philly, know that this Dec. 14 trip to Target on City Line Avenue was going to include being taken on a $1,000 shopping spree by an NBA player. Anton Moore, a former South Philly Review Difference Maker, provided the 76ers with names of families that were submitted to his Unity in the Community nonprofit that is dedicated to changing the lives of others in the South Philadelphia area. The organization received more than 30 nominations for its Operation Holiday Help initiative — now in its eighth year — that provides less fortunate families from various sections of the city generous donations of toys and gifts. The selected individuals will be receiving a surprise delivery on Christmas Eve. Last Thursday’s event, which was coordinated by the Sixers, was like finding a surprise gift under the Christmas tree. The nominators told the selected individuals they were going to a meeting. Once Simmons magically appeared to take the families shopping, it was time to start filling those big red carts. “They were very excited,” Moore said. It brought joy to the faces of families who are experiencing some tough times. Tymisha Johnson, who resides in Point Breeze with her two children, recently lost her mother to illness and a brother to gun violence. Michelle D’Auria, who also resides in South Philly, has a toddler and is experiencing some tough financial times. Simmons, with his 6-foot-10 frame, is accustomed to dishing out assists, averaging 7.9 per game. On this night, he helped the little ones get the desired items off the shelves and into the carts. However, he had nothing to do with getting Sixers mascot Franklin inside of the shopping cart. The holiday giving is one of many ways in which Unity in the Community continues to lend a helping hand around South Philly and beyond. Former Philadelphia Eagles defensive end Marcus Smith helped with getting a local student to the prom. Others have received support with finding a job. Every summer, the organization also hosts a Peace Week celebration that includes a massive block party. For Moore, last week’s trip to Target provided a feel-good moment as helping others during the holiday season is something he would think about during his childhood.